The reliability and dependability record of modern helicopters is very impressive. By following the manufacturer’s recommendations regarding periodic maintenance and inspections, you can eliminate most systems and equipment failures. Most malfunctions or failures can be traced to some error on the part of the pilot; therefore, most emergencies can be averted before they happen. An actual emergency is a rare occurrence. Antitorque failures usually fall into two categories. One focuses on failure of the power drive portion of the tail rotor system resulting in a complete loss of antitorque. The other category covers mechanical control failures where the pilot is unable to change or control tail rotor thrust even though the tail rotor may still be providing antitorque thrust. Tail rotor drive system failures include driveshaft failures, tail rotor gearbox failures, or a complete loss of the tail rotor itself. In any of these cases, the loss of antitorque normally results in an immediate yawing of the helicopter’s nose. The helicopter yaws to the right in a counter-clockwise rotor system and to the left in a clockwise system. 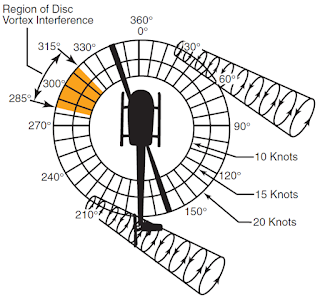 This discussion assumes a helicopter with a counter-clockwise rotor system. The severity of the yaw is proportionate to the amount of power being used and the airspeed. An antitorque failure with a high power setting at a low airspeed results in a severe yawing to the right. At low power settings and high airspeeds, the yaw is less severe. High airspeeds tend to streamline the helicopter and keep it from spinning. If a tail rotor failure occurs, power has to be reduced in order to reduce main rotor torque. The techniques differ depending on whether the helicopter is in flight or in a hover, but will ultimately require an autorotation. If a complete tail rotor failure occurs while hovering, enter a hovering autorotation by rolling off the throttle. If the failure occurs in forward flight, enter a normal autorotation by lowering the collective and rolling off the throttle. If the helicopter has enough forward airspeed (close to cruising speed) when the failure occurs, and depending on the helicopter design, the vertical stabilizer may provide enough directional control to allow you to maneuver the helicopter to a more desirable landing sight. Some of the yaw may be compensated for by applying slight cyclic control opposite the direction of yaw. This helps in directional control, but also increases drag. Care must be taken not to lose too much forward airspeed because the streamlining effect diminishes as airspeed is reduced. Also, more altitude is required to accelerate to the correct airspeed if an autorotation is entered into at a low airspeed. A mechanical control failure limits or prevents control of tail rotor thrust and is usually caused by a stuck or broken control rod or cable. While the tail rotor is still producing antitorque thrust, it cannot be controlled by the pilot. The amount of antitorque depends on the position where the controls jam or fail. Once again, the techniques differ depending on the amount of tail rotor thrust, but an autorotation is generally not required. A stuck left pedal, such as might be experienced during takeoff or climb conditions, results in the helicopter’s nose yawing to the left when power is reduced. Rolling off the throttle and entering an autorotation only makes matters worse. The landing profile for a stuck left pedal is best described as a normal approach to a momentary hover at three to four feet above the surface. Following an analysis, make the landing. If the helicopter is not turning, simply lower the helicopter to the surface. If the helicopter is turning to the right, roll the throttle toward flight idle the amount necessary to stop the turn as you land. If the helicopter is beginning to turn left, you should be able to make the landing prior to the turn rate becoming excessive. However, if the turn rate becomes excessive prior to the landing, simply execute a takeoff and return for another landing. The landing profile for a stuck neutral or a stuck right pedal is a low power approach or descent with a running or roll-on landing. The approach profile can best be described as a steep approach with a flare at the bottom to slow the helicopter. The power should be low enough to establish a left yaw during the descent. The left yaw allows a margin of safety due to the fact that the helicopter will turn to the right when power is applied. This allows the momentary use of power at the bottom of the approach. As you apply power, the helicopter rotates to the right and becomes aligned with the landing area. At this point, roll the throttle to flight idle and make the landing. The momentary use of power helps stop the descent and allows additional time for you to level the helicopter prior to closing the throttle. If the helicopter is not yawed to the left at the conclusion of the flare, roll the throttle to flight idle and use the collective to cushion the touchdown. As with any running or roll-on landing, use the cyclic to maintain the ground track. This technique results in a longer ground run or roll than if the helicopter was yawed to the left. Unanticipated yaw is the occurrence of an uncommanded yaw rate that does not subside of its own accord and, which, if not corrected, can result in the loss of helicopter control. This uncommanded yaw rate is referred to as loss of tail rotor effectiveness (LTE) and occurs to the right in helicopters with a counterclockwise rotating main rotor and to the left in helicopters with a clockwise main rotor rotation. 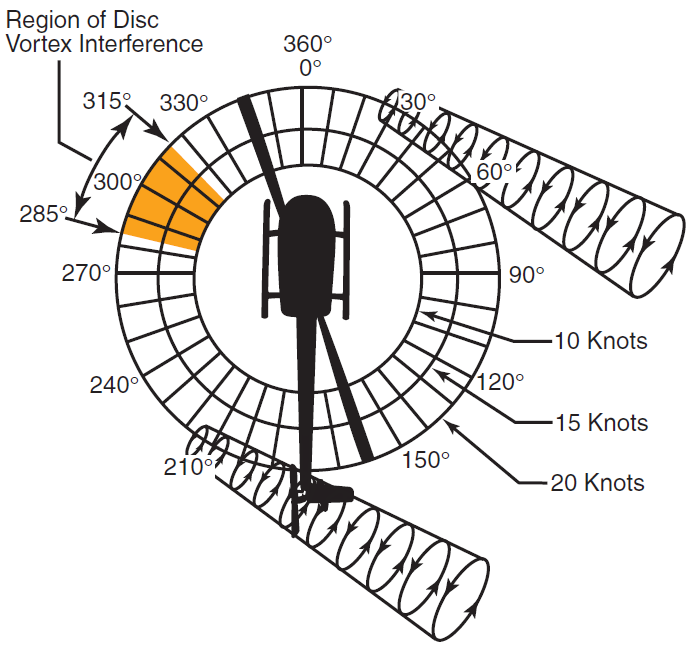 Again, this discussion covers a helicopter with a counter-clockwise rotor system and an antitorque rotor. LTE is not related to an equipment or maintenance malfunction and may occur in all single-rotor helicopters at airspeeds less than 30 knots. It is the result of the tail rotor not providing adequate thrust to maintain directional control, and is usually caused by either certain wind azimuths (directions) while hovering, or by an insufficient tail rotor thrust for a given power setting at higher altitudes. For any given main rotor torque setting in perfectly steady air, there is an exact amount of tail rotor thrust required to prevent the helicopter from yawing either left or right. This is known as tail rotor trim thrust. In order to maintain a constant heading while hovering, you should maintain tail rotor thrust equal to trim thrust. The required tail rotor thrust is modified by the effects of the wind. The wind can cause an uncommanded yaw by changing tail rotor effective thrust. Certain relative wind directions are more likely to cause tail rotor thrust variations than others. Flight and wind tunnel tests have identified three relative wind azimuth regions that can either singularly, or in combination, create an LTE conducive environment. These regions can overlap, and thrust variations may be more pronounced. Also, flight testing has determined that the tail rotor does not actually stall during the period. When operating in these areas at less than 30 knots, pilot workload increases dramatically. Refer to figure 1. Winds at velocities of 10 to 30 knots from the left front cause the main rotor vortex to be blown into the tail rotor by the relative wind. The effect of this main rotor disc vortex causes the tail rotor to operated in an extremely turbulent environment. During a right turn, the tail rotor experiences a reduction of thrust as it comes into the area of the main rotor disc vortex. The reduction in tail rotor thrust comes from the airflow changes experienced at the tail rotor as the main rotor disc vortex moves across the tail rotor disc. The effect of the main rotor disc vortex initially increases the angle of attack of the tail rotor blades, thus increasing tail rotor thrust. The increase in the angle of attack requires that right pedal pressure be added to reduce tail rotor thrust in order to maintain the same rate of turn. As the main rotor vortex passes the tail rotor, the tail rotor angle of attack is reduced. The reduction in the angle of attack causes a reduction in thrust and a right yaw acceleration begins. This acceleration can be surprising, since you were previously adding right pedal to maintain the right turn rate. This thrust reduction occurs suddenly, and if uncorrected, develops into an uncontrollable rapid rotation about the mast. When operating within this region, be aware that the reduction in tail rotor thrust can happen quite suddenly, and be prepared to react quickly to counter this reduction with additional left pedal input. In this region, the helicopter attempts to weathervane its nose into the relative wind. [Figure 2] Unless a resisting pedal input is made, the helicopter starts a slow, uncommanded turn either to the right or left depending upon the wind direction. If the pilot allows a right yaw rate to develop and the tail of the helicopter moves into this region, the yaw rate can accelerate rapidly. In order to avoid the onset of LTE in this downwind condition, it is imperative to maintain positive control of the yaw rate and devote full attention to flying the helicopter. Winds within this region cause a tail rotor vortex ring state to develop. [Figure 3] The result is a non-uniform, unsteady flow into the tail rotor. The vortex ring state causes tail rotor thrust variations, which result in yaw deviations. The net effect of the unsteady flow is an oscillation of tail rotor thrust. Rapid and continuous pedal movements are necessary to compensate for the rapid changes in tail rotor thrust when hovering in a left crosswind. Maintaining a precise heading in this region is difficult, but this characteristic presents no significant problem unless corrective action is delayed. However, high pedal workload, lack of concentration and overcontrolling can all lead to LTE. When the tail rotor thrust being generated is less than the thrust required, the helicopter yaws to the right. When hovering in left crosswinds, you must concentrated on smooth pedal coordination and not allow an uncontrolled right yaw to develop. 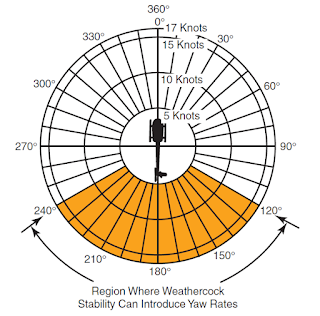 If a right yaw rate is allowed to build, the helicopter can rotate into the wind azimuth region where weathercock stability then accelerates the right turn rate. 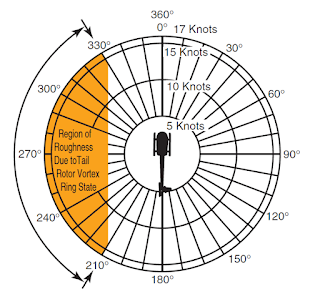 Pilot workload during a tail rotor vortex ring state is high. Do not allow a right yaw rate to increase. At higher altitudes, where the air is thinner, tail rotor thrust and efficiency is reduced. When operating at high altitudes and high gross weights, especially while hovering, the tail rotor thrust may not be sufficient to maintain directional control and LTE can occur. In this case, the hovering ceiling is limited by tail rotor thrust and not necessarily power available. In these conditions gross weights need to be reduced and/or operations need to be limited to lower density altitudes. To help reduce the onset of loss of tail rotor effectiveness, there are some steps can follow. Maintain maximum power-on rotor r.p.m. If the main rotor r.p.m. is allowed to decrease, the antitorque thrust available is decreased proportionally. Avoid tailwinds below an airspeed of 30 knots. If loss of translational lift occurs, it results in an increased power demand and additional antitorque pressures. Avoid out of ground effect (OGE) operations and high power demand situations below an airspeed of 30 knots. Be especially aware of wind direction and velocity when hovering in winds of about 8-12 knots. There are no strong indicators that translational lift has been reduced. A loss of translational lift results in an unexpected high power demand and an increased antitorque requirement. Be aware that if a considerable amount of left pedal is being maintained, a sufficient amount of left pedal may not be available to counteract an unanticipated right yaw. Be alert to changing wind conditions, which may be experienced when flying along ridge lines and around buildings. If a sudden unanticipated right yaw occurs, the following recovery technique should be performed. Apply full left pedal while simultaneously moving cyclic control forward to increase speed. If altitude permits, reduce power. As recovery is effected, adjust controls for normal forward flight. Collective pitch reduction aids in arresting the yaw rate but may cause an excessive rate of descent. Any large, rapid increase in collective to prevent ground or obstacle contact may further increase the yaw rate and decrease rotor r.p.m. The decision to reduce collective must be based on your assessment of the altitude available for recovery. 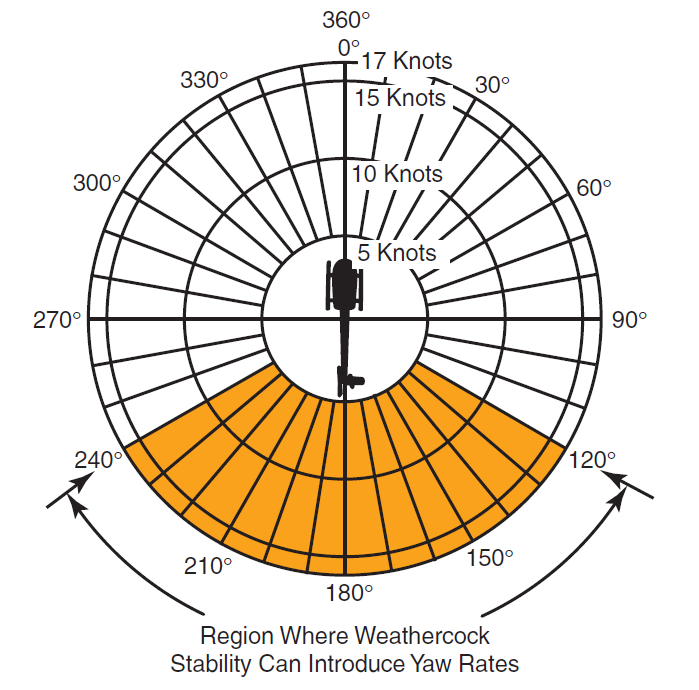 If the rotation cannot be stopped and ground contact is imminent, an autorotation may be the best course of action. Maintain full left pedal until the rotation stops, then adjust to maintain heading. The main drive shaft, located between the engine and the main rotor gearbox, transmits engine power to the main rotor gearbox. In some helicopters, particularly those with piston engines, a drive belt is used instead of a drive shaft. A failure of the drive shaft or belt has the same effect as an engine failure, because power is no longer provided to the main rotor, and an autorotation has to be initiated. There are a few differences, however, that need to be taken into consideration. If the drive shaft or belt breaks, the lack of any load on the engine results in an overspeed. In this case, the throttle must be closed in order to prevent any further damage. In some helicopters, the tail rotor drive system continues to be powered by the engine even if the main drive shaft breaks. In this case, when the engine unloads, a tail rotor overspeed can result. If this happens, close the throttle immediately and enter an autorotation. Most helicopters, other than smaller piston powered helicopters, incorporate the use of hydraulic actuators to overcome high control forces. A hydraulic system consists of actuators, also called servos, on each flight control; a pump, which is usually driven by the main rotor gearbox; and a reservoir to store the hydraulic fluid. A switch in the cockpit can turn the system off, although it is left on under normal conditions. A pressure indicator in the cockpit may be installed to monitor the system. An impending hydraulic failure can be recognized by a grinding or howling noise from the pump or actuators, increased control forces and feedback, and limited control movement. The corrective action required is stated in detail in the appropriate rotorcraft flight manual. 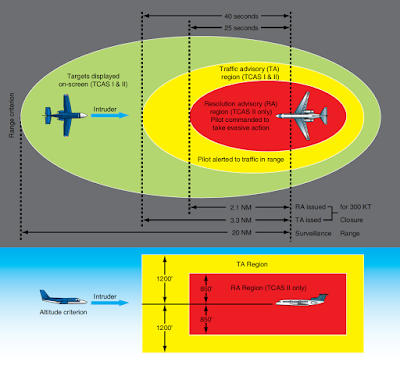 However, in most cases, airspeed needs to be reduced in order to reduce control forces. The hydraulic switch and circuit breaker should be checked and recycled. If hydraulic power is not restored, make a shallow approach to a running or roll-on landing. This technique is used because it requires less control force and pilot workload. Additionally, the hydraulic system should be disabled, by either pulling the circuit breaker and/or placing the switch in the off position. The reason for this is to prevent an inadvertent restoration of hydraulic power, which may lead to overcontrolling near the ground. In those helicopters where the control forces are so high that they cannot be moved without hydraulic assistance, two or more independent hydraulic systems may be installed. Some helicopters use hydraulic accumulators to store pressure that can be used for a short time while in an emergency if the hydraulic pump fails. This gives you enough time to land the helicopter with normal control. Governors automatically adjust engine power to maintain rotor r.p.m. when the collective pitch is changed. If the governor fails, any change in collective pitch requires you to manually adjust the throttle to maintain correct r.p.m. In the event of a high side governor failure, the engine and rotor r.p.m. try to increase above the normal range. If the r.p.m. cannot be reduced and controlled with the throttle, close the throttle and enter an autorotation. If the governor fails on the low side, normal r.p.m. may not be attainable, even if the throttle is manually controlled. In this case, the collective has to be lowered to maintain r.p.m. A running or roll-on landing may be performed if the engine can maintain sufficient rotor r.p.m. If there is insufficient power, enter an autorotation. With the many rotating parts found in helicopters, some vibration is inherent. You need to understand the cause and effect of helicopter vibrations because abnormal vibrations cause premature component wear and may even result in structural failure. With experience, you learn what vibrations are normal versus those that are abnormal and can then decide whether continued flight is safe or not. 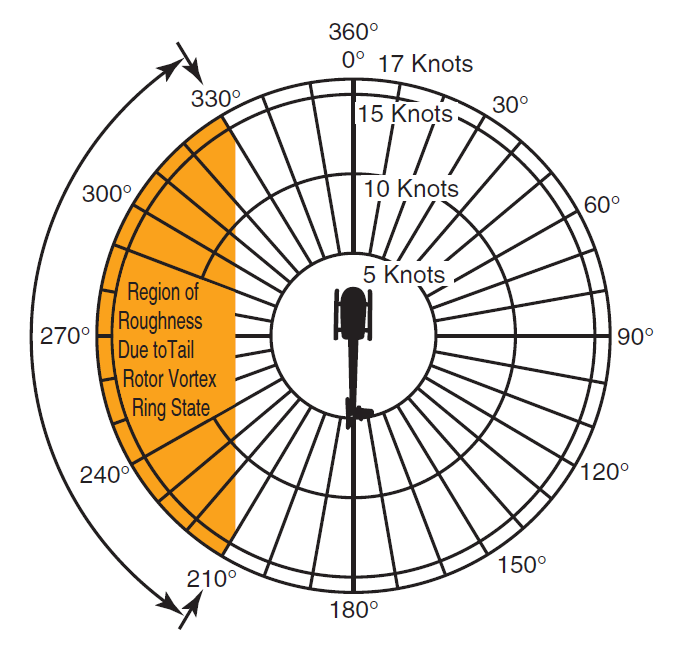 Helicopter vibrations are categorized into low, medium, or high frequency. Low frequency vibrations (100-500 cycles per minute) usually originate from the main rotor system. The vibration may be felt through the controls, the airframe, or a combination of both. Furthermore, the vibration may have a definite direction of push or thrust. It may be vertical, lateral, horizontal, or even a combination. Normally, the direction of the vibration can be determined by concentrating on the feel of the vibration, which may push you up and down, backwards and forwards, or from side to side. The direction of the vibration and whether it is felt in the controls or the airframe is an important means for the mechanic to troubleshoot the source. Some possible causes could be that the main rotor blades are out of track or balance, damaged blades, worn bearings, dampers out of adjustment, or worn parts. Medium frequency vibrations (1,000 - 2,000 cycles per minute) and high frequency vibrations (2,000 cycles per minute or higher) are normally associated with out-of-balance components that rotate at a high r.p.m., such as the tail rotor, engine, cooling fans, and components of the drive train, including transmissions, drive shafts, bearings, pulleys, and belts. Most tail rotor vibrations can be felt through the tail rotor pedals as long as there are no hydraulic actuators, which usually dampen out the vibration. Any imbalance in the tail rotor system is very harmful, as it can cause cracks to develop and rivets to work loose. Piston engines usually produce a normal amount of high frequency vibration, which is aggravated by engine malfunctions such as spark plug fouling, incorrect magneto timing, carburetor icing and/or incorrect fuel/air mixture. Vibrations in turbine engines are often difficult to detect as these engines operate at a very high r.p.m. Modern equipment used for tracking and balancing the main and tail rotor blades can also be used to detect other vibrations in the helicopter. These systems use accelerometers mounted around the helicopter to detect the direction, frequency, and intensity of the vibration. The built-in software can then analyze the information, pinpoint the origin of the vibration, and suggest the corrective action.